The kids take turns leading our meal-time prayers. On occasion (as we sit with hands folded over a plate of hot food), this will evolve into an argument over who gets to say the prayer. This argument is followed by a sharp look from mom or dad, then a verbal reprimand, then perhaps tears, concluded with the firm reminder that this is not how we talk to God!!! I call upon you, O Lord; come quickly to me; give ear to my voice when I call to you. I was floored! 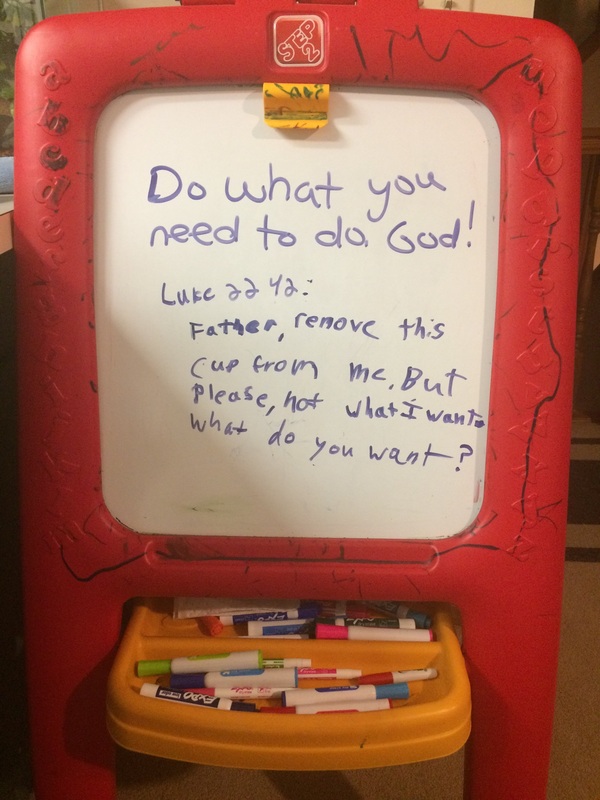 An innocent request from a developing mind, but deeply theological, a sign of great faith and trust, and a plea we adults need to utter more often! My son had discovered (with a little help from my husband) the story from the night of Jesus’ arrest. Jesus, faced with imminent persecution and death, sat in a garden. With his friends nearby, Jesus prayed that God’s will might be done. Do what you need to do, God! I trust you! How timely, at the beginning of Holy week, to remember this moment. When these words are read on Good Friday, will my son hear them a little bit differently? Will he understand the trust implied in those words, and how that moment might be a lesson for how we pray, and what we cry out to our God? A dear friend reminded me very recently how important it is to use the Lord’s prayer as a guide for our own prayers. (Matthew 6:9-13) Jesus instructed us how to pray… when we use those words as an outline, our prayer does not include a request for our own will to be done. We ask for God’s will to be done! These words are easy to recite in church each week, but more difficult to do in the real world. We cling so hard to what WE want, to our plans, to our image of what our lives should look like. God has bigger and better plans than we can even imagine. Our job is to simply trust! Categories: Prayer | Tags: argument, family meals, God, plans, prayer, trust, will | Permalink.